Click on the appropriate link below for your solution. our suppliers located throughout the U.S.
With their economical fuel usage, superior construction, and available larger sizes, Diamond refrigerators fit the bill for many families living off the grid, those seeking to reduce their dependence on electricity, or simply those who could use a reliable second refrigerator in the house or cabin. No electricity required! Click here to see our Diamond refrigerator offerings or here for their NEW 15 cu.ft. upright Freezer. NOTICE: The Crystal Cold gas refrigerators have not seen a price increase for several years; due to base metal prices and manufacturing costs, we will be looking at some substantial price increases by this Autumn. Be smart and buy your refrigerator now to beat the higher prices! We have these in the Hawaiian & Caribbean Islands, Canada, Alaska, and with missionaries and medical personnel in Africa and South America. Whether keeping medical supplies cold or just keeping your beer cold after a hurricane passes through, these gas refrigerators perform. These units are the biggest and most gas-efficient units made in America--built by the Amish for the Amish--who usually have large families and demand high performance. 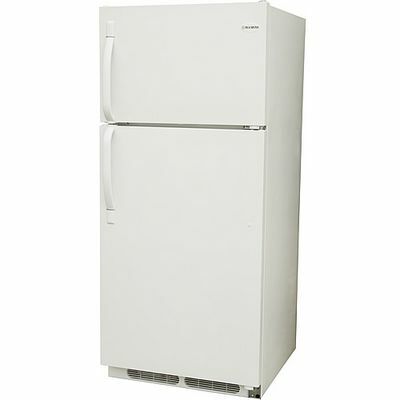 These heavy-duty refrigerators are designed to give decades of service. Click here for information on individual Crystal Cold models. The 22 cu. ft. upright gas freezer is the largest capacity propane freezer made, and with two gas-absorption cooling units they keep things COLD! Hand-made quality by the Amish in the Midwest, these have come along just in time as the Frosteks are being discontinued by the manufacturer. Starting at $2150 plus freight. Click here for more details. The Amish folks in the Midwest are cranking these out, but we are selling them as fast as they become available, Many models have 2 - 4 week lead times. Call us today at 1 (406) 777-4309 to find out availability and freight costs. Note: please read the important shipping information towards the bottom of this page. After a couple of years exploring the idea of manufacturing these stoves with glow bars, our supplier has informed us that, for the time being, they are going to continue to manufacturer most models without a glow bar. Three beautiful stainless steel styles to choose from. 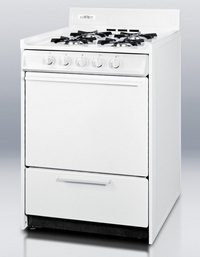 These high quality propane or natural gas kitchen ranges come in 24", 30" and the popular 6 burner 36" models. 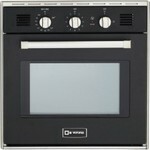 New models feature sealed burners with varied BTU outputs and 10 inch or 22 inch back guards. A variety of sizes, models, colors, and options are available including stainless steel, in these high quality natural gas or propane ranges, in 20," 24," 30," and 36" wide units. 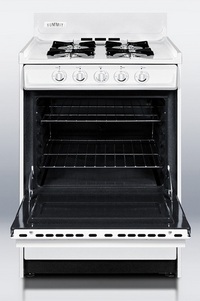 These are high quality, American made since 1912 gas kitchen stoves at affordable prices. To choose between different models, click here. To choose between our new cordless DC ranges that replace the standing gas pilot range, click here. but everything is included to easily convert these ranges for propane use. No power? No problem. Summit Appliance now offers four basic cordless ignition ranges, available in 20", 24", 30", and 36", white only. 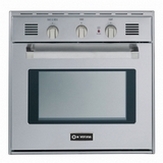 Drop-in cooktops are available in 24" and 30" widths, and in white, black, bisque, and chrome finishes. Click here to see all models available. Propane's density at 25�C is .493 grams per cubic centimeter. Converting gives 4.11 pounds per gallon. Propane weighs about 4.2 pounds per US gallon, at 60�F. Propane expands 1.5% per 10�F. Here are the technical data and flow diagram on how gas or heating element driven absorption systems cool your LP 'fridge or freezer--technical but informative. Do I need to vent my propane (LP) refrigerator? Most propane refrigerators do not require outside venting but find out the details by clicking on the link above. Are installation clearances that important on propane refrigerators? Yes! click on the link above to find out more or to order a replacement cooling unit. Five things to check for gas absorption cooling unit failure. Click on the above link to diagnose your ailing appliance.